Cristela is one of the latest Latino comedies to hit American television. Built around stand-up comedian Cristela Alonzo, it follows on from a legacy including Jane the Virgin, Devious Maids, Ugly Betty, Chico and the Man, and even Gloria from Modern Family and Ricky Ricardo in I Love Lucy. As a multicam comedy with laugh track it subscribes to a classic sitcom form -except that it feels about 30 years too late. 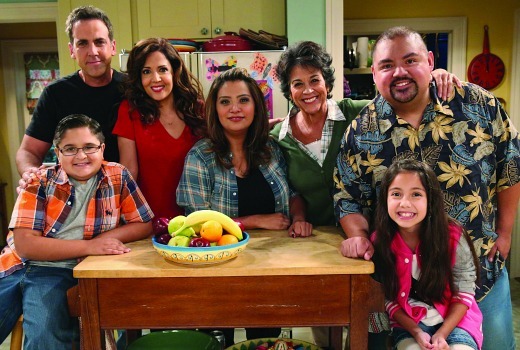 Cristela is an aspiring attorney who lives with her mother Natalia (Terri Hoyos), sister Daniela (María Canals Barrera) and brother in law Felix (Carlos Ponce) and their two kids. She’s a fulsome, outspoken gal who is quick with the wisecracks and stands up for herself in a community that is used to being the underdog. While her mother clings to memories of coming to America to overcome Mexican poverty, Cristela is not about to become anybody’s devious maid. She has her eye on a new internship at a legal firm but has to compete with a male applicant Josh (Andrew Leeds) and attractive female Maddie (Justine Lupe) who just happens to be the daughter of the firm’s boss Trent (Sam McMurray). At work and at home Cristela is competing to be heard, but it’s not a big challenge given she is so ably armed with comebacks. At home her brother-in-law dishes out the insults ad-nauseum, repeatedly hoping Cristela will move out (despite him living with his mother-in-law). His overweight cousin Alberto (Gabriel Iglesias) is a perpetual visitor, arriving at the door to an applause reminiscent of Laverne & Shirley‘s Lenny and Squiggy (but without any of their comic material). Whenever he is on screen it’s not much more than expressing his undying affections for Cristela, all met with hutzpah disdain. Much of the series relies on reinforcing the diversity of the central character. She’s Mexican-American, geddit? She’s single, geddit? She’s better than this, geddit? This differs significantly from a comedy such as Louie where Mexican-American Louis C.K. is justified for anything other than his ethnicity. Meanwhile, other US television shows such as Outsourced and Fresh off the Boat have moved on to other cultures (India, Taiwan respectively). It’s a shame because Alonzo has good timing and expression (in a Kathy Najimy kinda-way) but the vehicle is an utter disappointment that badly wants to be the next Chuck Lorre successor. The gags are forced, the audience sweetening is excruciating and it lacks originality. To me it feels like a Latino person’s cliche dream of what you will get if you make it in America and have your own muchacha sitcom. Ricky Ricardo was way funnier back in the 1950s. Cristela premieres 7:30pm Sunday February 1 on FOX8. I don’t recall any Hispanic characters in The Nanny. Mental blank? Apologies. I had been googling US history of ethnic TV characters. Fran slipped through my editing of the results. I have since corrected. Thanks for picking this up! @Beckala, I keep seeing the ads, and somehow think the kitchen, is the same one being used in Lat Man Standing. It may only be me, but even with things moved around slightly I can recognize some of the same things.